The first time I heard this word, our little league team had made it to the championship game. Our coach held a team meeting before the big game, spoke about our hard work, and many days of practicing until it got dark. He, expressed about how he felt and used this word. It struck my thoughts and hit a cord in my heart. I kept repeating the word over and over in my head, optimism, didn’t quite understand this word. Optimism, so I asked the coach, what does it mean? He look at me and said, it’s you. He began to explain what he meant, he said, remember what you told me on the first practice, that our team would win the championship, yes I remember, well that’s optimism. Well, we won and from that day forward, I looked at everything as being possible. As long as you are breathing oxygen and are willing, all things are possible. There are so many stories told about the human spirit overcoming any obstacle when put in our paths. Our minds, our will, and believing in ourselves conquers all doubt. I truly enjoy good competition amongst anything life has thrown my way. Even before its starts there is feeling of successfully overcoming and visualizing it before it happens, it’s like a dream or seeing into the future. The next time you are given an assessment, don’t become intimidated or second guess your ability, put pen to paper and get it done. Optimism, doesn’t mean it’s always going to be perfect, but feeling or realizing your best effort was made is all you can ask for. I don’t want you to get the wrong impression, you just can’t wish and expect things to happen, but, if you outline or forecast your projections by writing them out and taking the time to analyze your business solutions, you’ve optimism yourself. Nothing happens without a plan or direction, so before you start making wishes, ask yourself what have I done to a-line myself with my vision. I leave you with the definition, so before you start telling yourself it’s not possible, just remember this word. 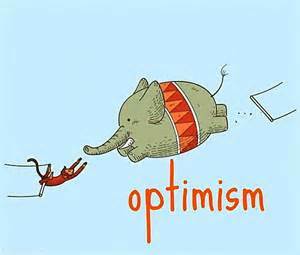 Optimism is a mental attitude or world view that interprets situations and events as being best (optimized), so that in some way that may not be fully comprehended the present moment is in an optimum state. The concept is extended to include the hope that future conditions will unfold as optimal.